In May, I had the great honor to visit the Homestead National Monument of America – a National Park site in Beatrice, Neb. that sits on the land that belonged to Daniel Freeman, one of the very first people to file a claim under the Homestead Act of 1862. 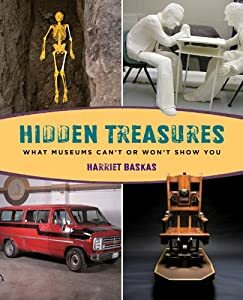 I was invited to be a guest speaker at the park’s “friends of” event because someone on the staff had read about my book, “Hidden Treasures: What Museums Can’t or Won’t Show You,” and offered me the chance to poke through some of the items kept tucked away in the storage cabinets to see what treasures we could find. Lots of things caught my attention, including dolls, old clothing, odd tools and scary medical devices. But my favorite item in the collection was this miniature top-hat, decorated with a yellow ribbon, that at first glance looks like it might be made of cork. But it’s not. According to the yellowed piece of paper taped to the top of the hat, it’s made from about $2,000 worth of mashed up bank notes. Park records date the note and the hat to around 1887. And while I’ve seen some old postcards and a few other items made of macerated money when visiting other museums, I was surprised and delighted to find this early souvenir in the collection of a historic site dedicated to homesteading. Just as unusual – but more in keeping with what I imagine was the necessary ‘homemade’ part of homesteading -was this tin item described as a tie. Park records describe the tie as being made of one long strip of tin bent around twice to form a bow tie effect, with two clamps on the back for fastening to a shirt. We all agreed it didn’t look like it would be too comfortable to wear. If you’re heading to – or through – Nebraska anytime soon, I urge you to make a point of visiting the Homestead National Monument of America. There’s a Heritage Center there with an award-winning movie about the history of homesteading, a wide variety of well-made and educational exhibits, an early schoolhouse and a cabin built in 1867. Best of all, there’s a restored tallgrass prairie you can walk through that has many of the plants and animals that once covered the central plains of the United States. A great time to go would be next weekend (June 13-15), during Homestead Days, when the park offers traditional and modern homesteading demonstrations, music, special guest presenters and more.